NurturMe is a baby food company that sells naturally grown quick dried baby food that come in light weight, palm-sized pouches. Each pouch has approx 2.5 oz of pureed baby food. You can mix the pouch contents with water, formula or breast milk and it is ready in seconds. The idea is similar to rice cereal where you add water or breast to create the consistency your baby will eat. The nice thing about these sweet little pouches is that you don't have to worry about carrying jars of baby food in your diaper bag, just pull out a pouch or 2 and mix it with your liquid of choice. 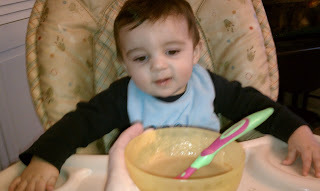 Depending on the age of your little one, from 4 months to toddler you can add as little or as much liquid as you want. There is a bit more information about the mixing here. 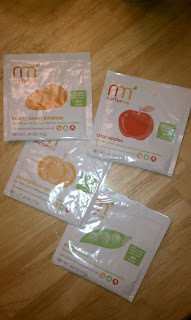 There are 4 flavors to choose from scrumptious squash, hearty sweat potatoes, plump peas and crisp apples. I combined the squash and apples together to create a larger meal and to change up the flavor. He loved it! Yummy for sure! I took a few pouches out with me on a lunch date with my girlfriend and it worked out great. I asked the waiter for a little bowl, poured out the pouch, added water (it was most convenient) and lunch was served. Not to mention no clean up for me! 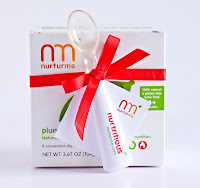 NurturMe is a nature conscious company that uses recyclable cartons made with wind energy and the with no jars to throw away this is a very "green" way to help the environment! 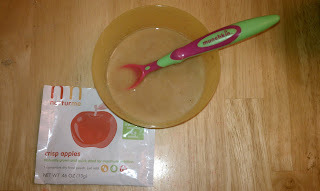 I recommend this to Mom's with little ones who babies are eating their "first" foods and like the convenience of a eco-friendly company. You can buy NurturMe foods online and at select Whole Foods stores and Babies R Us. This is a fairly new company and we look forward to more flavors in the future. They have a twitter campaign going on trying to get their product on the Mothers Day show on Ellen. I hope they get on and you can show your support by retweeting and tweeting to Ellen about it! *Limited to US residents; 18 years old and above. Giveaway starts March 17 , 2011 and ends on March 31, 2011 at midnight PST. Winner will be emailed and has 48 hours to respond before another winner is selected. I was not paid for this giveaway or post. I was provided one of each of the flavors for free for this review. I like Coupon Queen Bee on FB! I follow nurture me on twitter as hgardner16! I like nurture me on facebook as Hannah Rae. Following NuturMe on Twitter as "hopin2win"
Following Coupon Queen Bee on Twitter as "hopin2win". I follow NurturMe on Twitter! I like NurturMe on Facebook! I follow the Coupon Queen Bee on twitter! I follow the Coupon Queen Bee on FB!